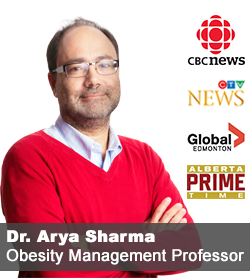 Starting this week, I will regularly post short excerpts from “Best Weight: A Practical Guide to Office-Based Weight Management“, recently published by the Canadian Obesity Network. This guide is meant for health professionals dealing with obese clients and is NOT a self-management tool or weight-loss program. However, I assume that even general readers may find some of this material of interest. “Best weight” is a non-statistical goal that is easy to set and easy to explain to patients. Patients can diet themselves down to any weight they put their minds to, but to maintain that weight, they need to actually enjoy the lifestyle that got them there. A patient’s best weight is therefore whatever weight they achieve while living the healthiest lifestyle they can truly enjoy. There comes a point when a person cannot eat less or exercise more and still like their life. The weight they attain while still liking their life is thus their “best” weight, as without the addition of pharmacotherapy or a surgical intervention, no further weight loss will be possible. We need to remember that in modern society, eating is not simply about survival. We use food for comfort and for celebration and, with the exception of religious prohibitions, there should be no forbidden foods. If your patient cannot use food to comfort or celebrate, or if they consider certain foods “forbidden,” then they are likely on a diet, and unfortunately diets are known to fail over 95% of the time. For sustainable weight management, a patient should be consuming the smallest number of calories that still allows them to enjoy each day. Some days will simply warrant more calories, such as birthdays, anniversaries, religious holidays, and days when injuries, illness or fights with loved ones occur. Simply put, ice-cream and cookies and their cultural and ethnic equivalents are vital parts of a rich life experience. With exercise, a patient should be encouraged to be as physically active as possible and include as much additional exercise as they can enjoy each day. Some days obviously will allow for more activity than others, but there is a maximum, above which the patient would run out of time or energy, hurt themselves or come to hate exercise. That is when they quit. Eating less and exercising more within the context of a life the patient does not enjoy is the very definition of a diet, which is why diets almost always fail over the long-term. If a patient does not enjoy the way they are living while they are losing weight, they will almost certainly revert to “normal” practices and gain the weight back. 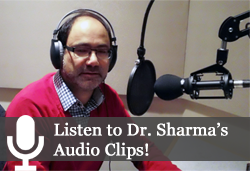 © Copyright 2010 by Dr. Arya M. Sharma and Dr. Yoni Freedhoff. All rights reserved. The opinions in this book are those of the authors and do not represent those of the Canadian Obesity Network. 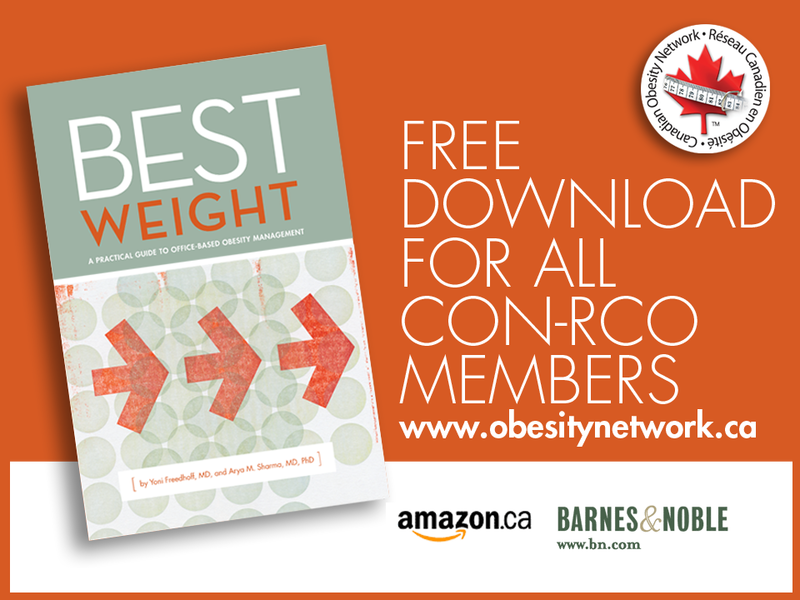 Members of the Canadian Obesity Network can download Best Weight for free. If you have already read Best Weight, please take a few minutes to leave a review on the Amazon or Barnes & Nobles website. What a great definition! Yes yes yes, if the changes in diet and exercise are just drudgery and/or painful then what will be the point in continuing? The sense of satisfaction in the level of activity and the permission to have some days different from others puts all this in a very balanced context, which is really nice to see. Wow. Those paragraphs are SO SMART and SO LOGICAL it blows my mind that to most of society (physicians, weight loss centers, educators, women’s magazines, nutritionists, health professionals and people in general) they’re a foreign concept. I would add, too, (and maybe the book does) that the idea of consuming the number of calories that allows one to still enjoy his/her life also entails finding sustainable eating practices that don’t destroy the quality of life — for example, if COUNTING calories or measuring portions or logging food or reading labels or constantly asking waiters what ingredients are in a menu item turns into nightmarish drudgery, an exercise in self-consciousness and embarrassment, or a time-consuming anvil hanging around one’s neck, that’s going to end up sapping one’s joy (I know it’s sapped mine!). Speaking only for myself, I think part of the idea of “enjoying life” is feeling that my activities ARE MINE, that I chose them, that I want to do them because they’re what are intrinsically meaningful and worthwhile to ME, and that they fit in with who I innately am…I mean, we ARE our thoughts, feelings, desires and passions, right? So, the times when I’ve felt my time and my activities disintegrating into dull, lengthy administrative work solely to support weight-loss, I was miserable. I remember saying things like, “I have no life anymore.” Contrary to that, about three months ago I started eating gluten-free and hypoallergenic in an attempt to figure out if I do indeed have Celiac Disease (which I’d suspected for years). This “diet plan” (if you can call it that, which I’d say you can) isn’t drudgery at ALL – there’s nothing about shopping for and preparing and eating gf meals that’s reducing my enjoyment of life (it’s increasing it immensely!) – so my hope is that I’ll keep this up as long as possible because it feels so good. Excellent excerpt. In my weight maintenance group, we refer to this as “attainable -vs- maintainable’ weight. This excerpt really nicely defines the difference between an attainable weight versus a lifetime maintainable weight. This is a great definition. I hope it becomes more popular and widely known. I believe Dr. Freedhoff wrote on his blog that you shouldn’t do things to lose weight that you aren’t willing to keep on doing forever. In other words, if you’re miserable you won’t keep at it. Now, this isn’t simply a question of “1,800 calories makes me miserable, but 2,000 is fine”, because it may depend a lot on what is in those 1,800 or 2000 calories. I know for me personally, for example, that the volume of food I eat has an effect on how satisfied I feel, regardless of the number of calories. Also I’m more likely to stay full if I have nuts as an afternoon snack than if I have fruit or a muffin. Same thing for exercise. Certain types of exercise will be more enjoyable for certain people than others. I have recently been reading some books on running and fitness by Dr. George Sheehan and I love how he distinguishes between exercise, play, and sport. Exercise is something that you force yourself to do, that you only do because it’s good for you. You need to find something that can be truly play and/or sport, if you want to keep on doing it. So while I am able to force myself to do up to 30 minutes on a stupid exercise bike, if I am commuting to work by bicycle and running with a goal of a certain time in the half-marathon in the spring, I am much more motivated because I am enjoying myself — and I want to keep on doing it. The National Weight Control Registry notes that people who successfully lose weight and keep it off are consistent in their eating – they don’t eat too much because it’s a holiday, they don’t use food as an escape drug when bad things happen. All those excuses for overeating helped make me fat in the first place. Aside from physiological/metabolic reasons preventing weight loss, this idea that “some days warrant more calories” is one reason why people don’t lose weight. There is ALWAYS a celebration/sad occasion/fight with a loved one etc etc that an overweight person habitually uses as a reason to eat too much. If you really think a birthday party is a valid reason for not eating right, then weight control isn’t really a serious medical issue. If someone had a dangerous food allergy you wouldn’t tell them to eat the dangerous food because it is a party.